Summer is the best time of year! The days are longer, the weather is perfect for kickin’ back on the porch with some friends, sharing some food, and dare I say cake! But Summer can be brutal on Sugar Art, especially Buttercream! So how can you get your Buttercream babies through the hot summer nights? With a few basics, and a back up plan! A chilled cake means a chilled decorator! You’ve probably heard me say this before, but the greatest tool at your disposal is refrigeration. Not only does it keep your cake fresh, it keeps your cake STABLE. When heat gets involved, Buttercream can become soft, ruining not only the look of your cake, but also its structural integrity. When in doubt, put it in the fridge, or at the very least, air-conditioning. Bringing cakes to room temperature from refrigeration in Summer can cause condensation, which happens when the cake warms up too quickly. You can reduce the impact of condensation, by either bringing the cake to temperature in an air-conditioned room, or in front of a table fan, which will also help to dry the surface of your cake as it warms up. While thick layers of Buttercream goodness certainly sounds good in theory, thinner layers of both cake and filling, are far more stable. You’ll get less movement with thinner layers, and you’ll reduce the risk of “love handle’ bulge as well! The same also holds true for runny or gooey fillings, like custard. Not only will these fillings give you stability issues, they also MUST be refrigerated for food safety. In extreme heat, quickly perishable filled cakes should be kept in the fridge until serving. It can also be a good idea to ‘dam’ your cakes. A dam is a ring of frosting, either Buttercream or ganache that circles each layer of cake, holding back the filling. If its particularly hot, substituting some of your butter for shortening can help give you that bit more strength in your dam. Shortening is a animal or vegetable fat that is solid at room temperature. It is generally used much the same as butter, in pastries, cakes and frostings, with cakes using primarily High Ratio Shortening. High Ratio Shortening has micro-emulsifers that allow the shortening to hold more water and sugar, giving you a smoother, fluffier result. A properly supported cake won’t sink. Simple as that. While you should always stack your cakes properly, its especially important in warmer weather. Whether its wooden dowels, Straws, or some form of premade cake stacking frame, ensure you are using the chosen method correctly for both your type of cake, and the weight it needs to support. While straws are surprisingly adept at supporting heavy modelled figures, you still need more straws than you do wooden dowels, so plan accordingly. Its also worth noting that corrugated cardboard cake rounds are not sufficient for stacking tall, heavy cakes, so use sturdy wooden boards instead. The type of cake you use can play a part too. Soft, delicate sponges are far more likely to tear or crumble under stress, whereas densely crumbed cakes like Pound cakes and mud cakes are perfect for stacking, as well as carving. Another great tip, is to make your dowels just a little longer than the cake tier, which prevents the cake above from putting any pressure on the cake below. You can cover the gap with lovely piped border, or even ribbon. It also makes the stacked cake easier to disassemble! Center doweling involves running a wooden or steel dowel down the centre of your cake, and into the cake board. Some people swear by it, others say its unnecessary, either way, its only useful if your cake is stable. Hot, soft cake will rip from a centre dowel just as easily, so be sure to take the time to stack and stabilise your cakes properly! I really don’t like shortening, this is no great secret, however in some climates, even in airconditioning, straight up Buttercream just CANNOT handle the heat. A good mix is about 75% Butter to 25% Shortening. You still retain the Butter flavour, but you get the added stability of shortening. There’s also another, tastier option; ganache. Ganache is room temperature stable for both heat, and perishability, and it tastes a whole lot better than shortening! You can add it to your Buttercream, you can whip it up so its spreadable, and you can use it straight, for maximum stability. White Chocolate is also more heat stable than Dark Chocolate, due to its Cocoa Solids content. 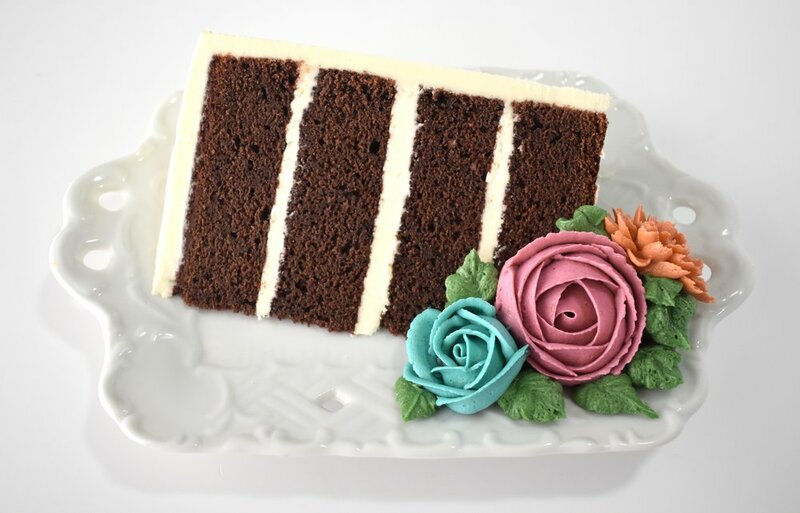 Basic Buttercream is terrific for Buttercream Flowers, but in times of extreme heat or high humidity, the best option is a shortening only Buttercream. DRY, before attaching to your cake. While yes, this will affect the taste and texture of your flowers, they will stay practically perfect, so its a trade off really! Now comes the fun part! Just how do you move your cake about, when its hot enough to curl your eyelashes? Carefully! Travelling with cakes is a delicate process, and those small speed humps that may not seem like much when you are driving to and from the store, feel like Everest when you have a precious, and precarious cake on board! You can of course centre dowel your cake for extra stability, and its a good idea to keep your cake refrigerated right up until travel too. Not only will this help to keep your cake and your frosting firm, but it will give it a heads start against perishing while out in the heat. You can also get creative with your transport too. CakeSafe is a great product for securely transporting tiered cakes, and you can even make your own ‘cool box’ using dry ice. Avalon’s Cake School has a great free tutorial showing how its done. While even here in Sydney we get some EXTREME weather, its also still worth remembering that we are talking about dessert. There are many ways that you can heat proof your cake, but at the end of the day, let how your cake taste be your guiding force. Life is too short to eat bad cake!